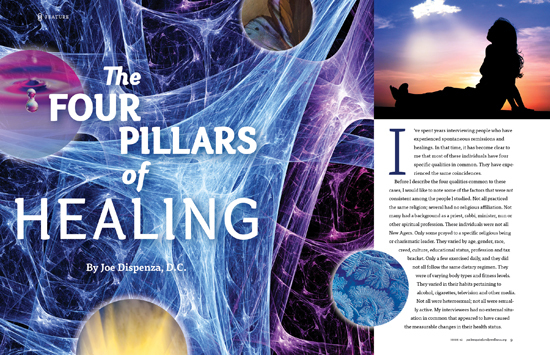 Author // Joe Dispenza, D.C.
I’ve spent years interviewing people who have experienced spontaneous remissions and healings. In that time, it has become clear to me that most of these individuals have four specific qualities in common. They have experienced the same coincidences. Before I describe the four qualities common to these cases, I would like to note some of the factors that were not consistent among the people I studied. Not all practiced the same religion; several had no religious affiliation. Not many had a background as a priest, rabbi, minister, nun or other spiritual profession. These individuals were not all New Agers. Only some prayed to a specific religious being or charismatic leader. They varied by age, gender, race, creed, culture, educational status, profession and tax bracket. Only a few exercised daily, and they did not all follow the same dietary regimen. They were of varying body types and fitness levels. They varied in their habits pertaining to alcohol, cigarettes, television and other media. Not all were heterosexual; not all were sexually active. My interviewees had no external situation in common that appeared to have caused the measurable changes in their health status. The people I spoke with who experienced a spontaneous remission believed that a higher order or intelligence lived within him or her. Whether they called it their divine, spiritual or subconscious mind, they accepted that an inner power was giving them life every moment, and that it knew more than they, as humans, could ever know. Furthermore, if they could just tap into this intelligence, they could direct it to start working for them. I have come to realize that there is nothing mystical about this greater mind. It is the same intelligence that organizes and regulates all the functions of the body. This power keeps our heart beating without interruption more than 100,000 times per day, without our ever stopping to think about it. That adds up to more than 40 million heartbeats per year, nearly 3 billion pulsations over a lifetime of 70 to 80 years. All this happens automatically, without care or cleaning, repair or replacement. An elevated consciousness is evidencing a will that is much greater than our will. Likewise, we give no thought to what our heart is pumping: two gallons of blood per minute, well over 100 gallons per hour, through a system of vascular channels about 60,000 miles in length, or twice the circumference of the Earth. Yet the circulatory system makes up only about 3 percent of our body mass. Every 20 to 60 seconds, each blood cell makes a complete circuit through the body, and every red blood cell makes anywhere between 75,000 and 250,000 round trips in its lifetime. (By the way, if all of the red blood cells in your bloodstream were lined up end to end, they would reach 31,000 miles into the heavens.) In the second it takes you to inhale, you lose 3 million red blood cells, and in the next second, the same number will be replaced. How long would we live if we had to focus on making all this happen? Some greater, more expanded, mind must be orchestrating all of this for us. Please stop reading for one second. Just now, some 100,000 chemical reactions took place in every single one of your cells. Now multiply 100,000 chemical reactions by the 70 to 100 trillion cells that make up your body. The answer has more zeros than most calculators can display, yet every second, that mindboggling number of chemical reactions takes place inside of you. Do you have to think to perform even one of those reactions? Many of us can’t even balance our checkbooks or remember more than seven items from our shopping lists, so it’s fortunate for us that some intelligence smarter than our conscious mind is running the show. In that same second, 10 million of your cells died, and in the next instant, almost 10 million new cells took their place. The pancreas itself regenerates almost all its cells in one day. Yet we give not a moment’s thought to the disposal of those dead cells, or to all of the necessary functions that go into mitosis, the process that gives rise to the production of new cells for tissue repair and growth. Recent calculations estimate that the communication between cells actually travels faster than the speed of light. At the moment, you are probably giving some thought to your body. Yet something other than your conscious mind is causing the secretion of enzymes in exact amounts to digest the food you consumed into its component nutrients. Some mechanism of a higher order is filtering liters of blood through your kidneys every hour to make urine and eliminate wastes. (In one hour, the most advanced kidney dialysis machines can only filter 15 to 20 percent of the body’s wastes from the blood.) This superior mind precisely maintains the 66 functions of the liver, although most people would never guess that this organ performs so many tasks. And lastly, if you committed to not arising to face the day until you actually felt like that new ideal, you would also be conditioning the body to finally work together with your new mind. Actually, your thoughts condition your mind and your feelings condition your body. And when you have mind and body working together, you have the power of the universe behind you. When you walk through your life that day, maintaining this modified state, something should be different in your world as a result of your effort. No one is excluded from this phenomenon. The same intelligence can direct tiny proteins to read the sophisticated sequence of the DNA helix better than any current technology. That’s some feat, considering that if we could unravel the DNA from all the cells of our body and stretch it out end to end, it would reach to the sun and back 150 times! Somehow, our greater mind orchestrates tiny protein enzymes that constantly zip through the 3.2 billion nucleic acid sequences that are the genes in every cell, checking for mutations. Our own inner version of Homeland Security knows how to fight off thousands of bacteria and viruses without our ever needing to realize that we are under attack. It even memorizes those invaders so that if they enter us again, the immune system will be better prepared. Most marvelous of all, this life force knows how to start from just two cells, a sperm and an egg, and create our almost 100 trillion specialized cells. Having given us life, it then continually regenerates that life and regulates an incredible number of processes. We may not notice our higher mind at work, but the moment we die, the body starts to break down because this inner power has left. Like the people I interviewed, I have had to acknowledge that some intelligence is at work in us that far exceeds our conscious abilities. It animates our body every single moment, and its incredibly complex workings take place virtually behind our back. We’re conscious beings, but typically, we pay attention only to events that we think are important to us. Those 100,000 chemical reactions every second in our 100 trillion cells are a miraculous expression of the life force. Yet the only time they become significant to the conscious mind is when something goes wrong. This aspect of the self is objective and unconditional. If we are alive, this life force is expressing itself through us. We all share this innate order, independent of gender, age and genetics. This intelligence transcends race, culture, social standing, economic status and religious beliefs. It gives life to everyone, whether we think about it or not, whether we are awake or asleep, whether we are happy or sad. A deeper mind permits us to believe whatever we want, to have likes and dislikes, to be allowing or judgmental. This giver of life lends power to whatever we are being; it bestows on us the power to express life in whatever way we choose. This intelligence knows how to maintain order among all of the cells, tissues, organs and systems of the body because it created the body from two individual cells. Again, the power that made the body is the power that maintains and heals the body. My subjects’ illnesses signified that, to some extent, they had gotten out of touch or distanced themselves from part of their connection with this higher order. Maybe their own thinking had somehow directed this intelligence toward illness and away from health. But they came to understand that if they tapped into this intelligence and used their thoughts to direct it, it would know how to heal their bodies for them. Their greater mind already knew how to take care of business, if they could only make contact with it. The abilities of this innate intelligence, subconscious mind or spiritual nature are far greater than any pill, therapy or treatment, and it is only waiting for our permission to willfully act. We are riding on the back of a giant, and we’re getting a free ride. The way we think affects our body as well as our life. You may have heard this concept expressed before in various ways—for example, in the phrase “mind over matter.” The people I interviewed not only shared this belief but also used it as a basis for making conscious changes in their own minds, bodies and personal lives. To understand how they accomplished this, I began to study the growing body of research on the relationship between thought and the physical body. There is an emerging field of science called psychoneuroimmunology that has demonstrated the connection between the mind and the body. I can describe what I learned in these simplistic terms: Your every thought produces a biochemical reaction in the brain. The brain then releases chemical signals that are transmitted to the body, where they act as the messengers of the thought. The thoughts that produce the chemicals in the brain allow your body to feel exactly the way you were just thinking. So every thought produces a chemical that is matched by a feeling in your body. Essentially, when you think happy, inspiring or positive thoughts, your brain manufactures chemicals that make you feel joyful, inspired or uplifted. For example, when you anticipate an experience that is pleasurable, the brain immediately makes a chemical neurotransmitter called dopamine, which turns the brain and body on in anticipation of that experience and causes you to begin to feel excited. If you have hateful, angry or self-deprecating thoughts, the brain also produces chemicals called neuropeptides that the body responds to in a comparable way. You feel hateful, angry or unworthy. You see, your thoughts immediately do become matter. When the body responds to a thought by having a feeling, this initiates a response in the brain. The brain, which constantly monitors and evaluates the status of the body, notices that the body is feeling a certain way. In response to that bodily feeling, the brain generates thoughts that produce corresponding chemical messengers; you begin to think the way you are feeling. Thinking creates feeling, and then feeling creates thinking, in a continuous cycle. The more we think the same thoughts, which then produce the same chemicals, which cause the body to have the same feelings, the more we physically become modified by our thoughts. In this way, depending on what we are thinking and feeling, we create our state of being. What we think about and the energy or intensity of these thoughts directly influences our health, the choices we make and, ultimately, our quality of life. Applying this reasoning to their own lives, many interviewees understood that many of their thoughts not only did not serve their health, but also might be the reason their unhappy or unhealthy conditions developed in the first place. Many of them had spent nearly every day for decades in internal states of anxiety, worry, sadness, jealousy, anger or some other form of emotional pain. Thinking and feeling, feeling and thinking like that for so long, they said, is what had manifested their conditions. Here’s an example: Developing one digestive ailment after another and living with constant pain in his spine finally prompted Tom to examine his life. Upon selfreflection, he realized that he had been suppressing feelings of desperation caused by the stress of staying in a job that made him miserable. He had spent two decades being angry and frustrated with his employer, coworkers and family. Other people often experienced Tom’s short temper, but for all that time, his secret thoughts had revolved around self-pity and victimization. Repeatedly experiencing these rigid patterns of thinking, believing, feeling and living amounted to toxic attitudes that Tom’s body just “couldn’t stomach.” His healing began, Tom told me, when he recognized that his unconscious attitudes were the basis for his state of being—for the person he had become. Most of those whose case histories I studied reached conclusions similar to Tom’s. To begin changing their attitudes, these individuals began to pay constant attention to their thoughts. In particular, they made a conscious effort to observe their automatic thought processes, especially the harmful ones. To their surprise, they found that most of their persistent, negative inner statements were not true. In other words, just because we have a thought does not necessarily mean that we have to believe it is true. As a matter of fact, most thoughts are ideas that we make up and then come to believe. Believing merely becomes a habit. For example, Sheila, with all her digestive disorders, noticed how often she thought of herself as a victim without the capacity to change her life. She saw that these thoughts had triggered feelings of helplessness. Questioning this belief enabled her to admit that her hardworking mother had done nothing to prevent or dissuade Sheila from going after her dreams. Some of my subjects likened their repetitive thoughts to computer programs running all day, every day, in the background of their lives. Since these people were the ones operating these programs, they could elect to change or even delete them. This was a crucial insight. At some point, all those I interviewed had to fight against the notion that one’s thoughts are uncontrollable. Instead, they had to choose to be free and to take control of their thinking. Everyone had resolved to interrupt habitual negative thought processes before they could produce painful chemical reactions in their body. These individuals were determined to manage their thoughts and eliminate ways of thinking that did not serve them. Conscious thoughts, repeated often enough, become unconscious thinking. In a common example of this, we must consciously think about our every action while we are learning to drive. After much practice, we can drive 100 miles from point A to point B and not remember any part of the trip, because our subconscious mind is typically at the wheel. We’ve all experienced being in an unaware state during a routine drive, only to feel our conscious mind re-engaging in response to an unusual engine sound or the rhythmic thump of a flat tire. So if we continually entertain the same thoughts, they’ll start off as conscious ones, but they’ll ultimately become unconscious, automatic thought programs. There is a sound explanation in neuroscience for how this happens. These unconscious ways of thinking become our unconscious ways of being. And they directly affect our lives just as conscious thoughts do. Just as all thoughts set off biochemical reactions that lead to behavior, our repetitive, unconscious thoughts produce automatic, acquired patterns of behavior that are almost involuntary. These behavioral patterns are habits and most surely, they become neurologically hardwired in the brain. It takes awareness and effort to break the cycle of a thinking process that has become unconscious. First, we need to step out of our routines so we can look at our lives. Through contemplation and self-reflection, we can become aware of our unconscious scripts. Then, we must observe these thoughts without responding to them, so that they no longer initiate the automatic chemical responses that produce habitual behavior. Within all of us, we possess a level of self-awareness that can observe our thinking. We must learn how to be separate from these programs and when we do, we can willfully have dominion over them. Ultimately, we can exercise control over our thoughts. In doing so, we are neurologically breaking apart thoughts that have become hardwired in our brain. Since we know from neuroscience that thoughts produce chemical reactions in the brain, it would make sense, then, that our thoughts would have some effect on our physical bodies by changing our internal state. Not only do our thoughts matter in how we live out our lives, but our thoughts become matter right within our own bodies. Thoughts…matter. Out of their belief that thoughts are real, and that the way people think directly impacts their health and their lives, these individuals saw that their own thinking processes were what had gotten them into trouble. They began to examine their life analytically. When they became inspired and diligent about changing their thinking, they were able to revitalize their health. A new attitude can become a new habit.